A United Airlines flight headed for San Francisco was evacuated late Tuesday due to apparent engine fire, officials said. Bob Redell reports. 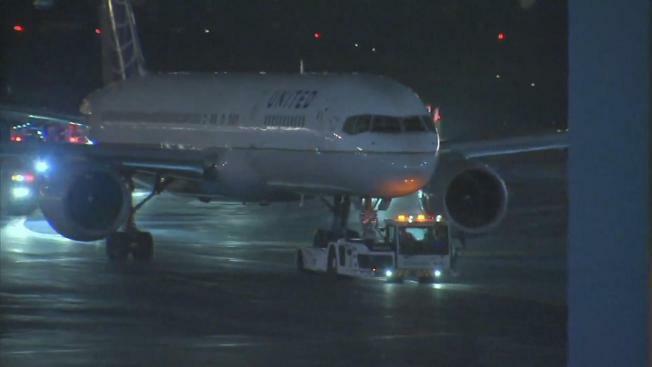 Dozens of United Airlines passengers touched down in San Francisco early Wednesday, following a scare on a New Jersey tarmac. An engine fire at Newark Liberty International Airport on Tuesday forced the emergency evacuation of flight 1579. Travelers made it to the Bay Area around 3:45 a.m. – about four hours later than planned. The pilot had just announced the flight was eighteenth in line for takeoff when some passengers started to smell jet fuel. United spokesman Jonathan Guerin said air traffic control notified the crew about flames coming out of one of their engines. United flight attendants immediately deployed chutes to get 124 passengers and 7 crew members safely off the aircraft. Five people sustained minor injuries. Newark Airport was temporarily closed as a result. Portia Dixon of Oakland is nursing a sore ankle, which she twisted in the pandemonium while getting off the plane. "People started shouting, ‘Fire! Evacuate!’ and then people were just running and jumping and the stewardess was screaming and it was very traumatic," she said. To that, Pacifica resident Rus Allen said, "People started grabbing their luggage and I'm like, 'OK. No. Don't grab your baggage. Get off the plane.'" He said he urged people to avoid reaching into overhead bins to grab large bags, and instead get themselves to safety. Flight 1579 was already experiencing a delay when the fire broke out, prompting another passenger to wonder if the engine would have burst into flames mid-flight, had they left on time.